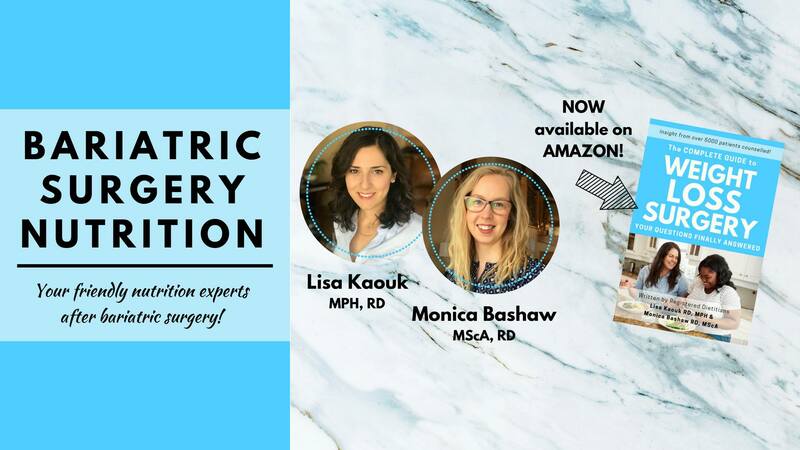 We’re sure it’s not news to you that shifting from a dieting mentality to one of flexibility and moderation after WLS is an important transition to feel truly at peace with food. But making the shift out of a dieters world is HARD! Most of our patients can acknowledge that the 5 points listed below are true, but their broken and complicated relationships with food and their bodies are holding them back from fully internalizing these mindsets. When you are able to yield to these truths, food becomes way less overwhelming, and simply falls into place. 1. My weight does not determine my success nor worth. Isn’t that SUCH a good quote? Is your WLS team happy with your progress, but you aren’t? Why are you still pushing for and obsessing over those next 10 lbs? Reflect on why you feel that you must lose those extra pounds and what will happen if you don’t? 2. I acknowledge that a healthy lifestyle (i.e. eating healthy most of the time and moving my body often) is a part-time job. Some weeks it doesn’t feel like work, but often it does. It is important to accept that doing well after WLS is not an accident. You have to make the time for your new habits. 3. I see meal planning, grocery shopping, and cooking as acts of self-care. This mindset shift is HUGE. Embracing this shift requires practicing gratitude. For example, this means being able to acknowledge that although you may not enjoy cooking, you are thankful to have food to put on the table. Or, as another example, maybe you don’t enjoy meal planning, but you can acknowledge how much smoother getting organized on the weekend makes your week flow. Try viewing these chores from a place of gratitude this week, and watch how much lighter they all of sudden feel. 4. I move my body because it feels good and helps me to re-charge. I don’t exercise to control my weight. If you are exercising solely for the purpose of controlling your weight, it is only a matter of time before you burn yourself out. Moving your body should come from a place of self-care. The activities that you choose should be enjoyable and energizing. They shouldn’t feel forced. 5. I am not on a diet. I eat foods that I enjoy. I practice moderation and flexible eating to the best of my ability. If you feel restricted, if you’re counting your calories daily, if you’re always hungry, or if you often feel guilty or ashamed about your food choices, you are going to burn yourself out! If you have dieted for most of your life, you likely have a lot of baggage in this department to work through. For many of our patients, it takes years to work through this mindset shift, so don’t be too hard on yourself. So, how many of these mindset shifts have you fully embraced? Which ones are still a struggle? Where do you feel stuck? Try posting these 5 mindset shifts up in your office or home to keep them top of mind as you go about your day. Envision and journal about what it would feel like and look like to embrace all of them. 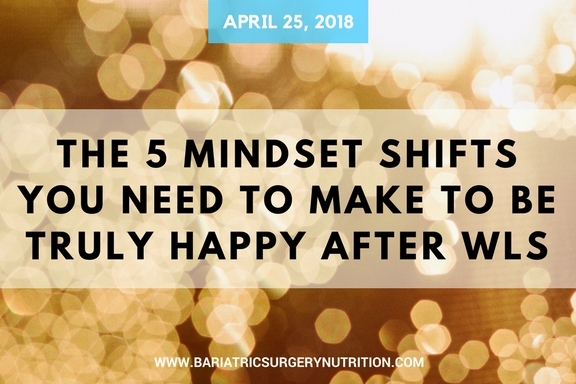 Click HERE for a FREE printable of these 5 mindset shifts! Click HERE to read more about this kind of content. Click HERE to follow our Facebook page for up-to-date videos and nutrition information. If you need help working through these shifts, speak with your WLS dietitian or psychologist. Wishing you all much happiness in your WLS journey! I don't agree with no. 2 (I also think it contradicts number 4 quite a bit) . A lot of people having WLS have full times jobs and families they need/want to be there for. Who needs a part time job on top of this? Sounds a bit too stressful to be sustainable and a nice road to burning out. Otherwise I wholeheartedly agree. I think treatment teams should especially focus on no. 5. When browsing the boards I'm not able to see a lot of this mindset. It's evil this, evil that. I sinned. I ate bad food xyz. People continue to act like this is just another strict diet and believe they will be able to sustain it because they had surgery. Sometimes I wonder if the "failure rates" are closely related to dieting burnout and the inevitably following binge.